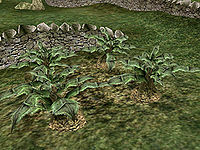 Harvest this root at the Arvel Plantation, north of Vivec. Travel to the Arvel Plantation to get some Corkbulb Root. Harvest five pieces of corkbulb. Synnolian Tunifus at the Imperial Chapels in Ebonheart will ask you to run another errand to fetch five pieces of Corkbulb Root. Tunifus tells you to visit the Arvel Plantation to get the ingredient and teaches you the Swimmer's Blessing spell, so that you can take a more direct route to the farm. You can find the Arvel Plantation east of Pelagiad, on the Ascadian Isles. If you cannot find all five units of the root there, try checking at the Llovyn farm, southwest of the Dren Plantation (though any corkbulb will work). Return to Tunifus with the corkbulb to receive a Potion of Cure Common Disease and a Standard Restore Health Potion. If you fail to collect enough corkbulb root, Tunifus' disposition towards you drops by ten. 1 Synnolian Tunifus needs five units of corkbulb root for cure common disease and restore health potions. The Imperial Cult has an agreement with the Ascadian Isles plantation owners that permits us to gather corkbulb, so that's a good place to look. Since I have to cross water, he taught me a little spell. 5 Finishes quest I told Synnolian Tunifus I would not be able to bring him the five units of corkbulb root he asked for. He was disappointed, and told me to take a day to reflect on my shortcomings, and attempt to amend them before I approach him again for a lay healer mission. 50 Finishes quest I delivered five units of corkbulb root to Synnolian Tunifus. He gave me a cure common disease potion and a restore health potion as a reward. 1 Finishes quest I told Synnolian Tunifus I would not be able to bring him the five units of corkbulb root he asked for. He was disappointed, and told me to take a day to reflect on my shortcomings, and attempt to amend them before I approach him again for a lay healer mission. This page was last modified on 23 November 2018, at 06:25.